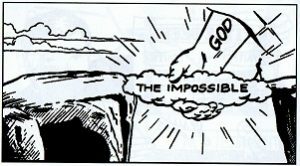 The difficult God does immediately; the impossible might take a little longer. So if you nee d a miracle, never give up and never take no for an answer. Nothing is too hard for God (Jeremiah 32:27). He can do anything if you’ll just give Him a chance. God can do anything, anything, anything, God can do anything but fail! Got any rivers you think are uncross-able? And He can do what no other friend can do! (Prayer:) We know, Lord, that You can do whatever we need done, and we know You will do it if we’ll believe and trust You. You always make a way if we obey and do it Your way. If we do all we can do, You’ll do the rest. Even when it comes to the impossible, You’re an expert at that (Luke 1:37). So help us to do all we can and then trust You for the impossible. You can do anything but fail, and we’ll never fail as long as we trust You!